We were still several days away from the foothills of the Alps and Bill started bubbling over with anticipation. Memories of our 2 previous Alp’s crossings came flooding back with Hochtor Pass on Grossglockner Strasse last year and Splugen Pass and our self-appointed German guide, Ullie the year before. And grand images of the always dramatic Drei Zinnen popped up, the stunning cluster of 3 peaks near Cortina that we would be revisiting. Bill kept scanning the horizon, hoping to get a glimpse of the mountains through the pollution—just like the haze veiled them last year until we were at their base. The visual and real coolness of the mountains will be a welcome relief from the drier and sparser lands of Greece that are still etched in our memories. And the cuisine in the Alps can be the best of both worlds for us with the heavy, hearty German breads and muesli cereals; the fine pastas and prepared sauces of Italy; and the plentiful fresh produce of both regions. Mountain riding is always hard but the views are grand and the sense of aliveness they both bring is exhilarating. After a glancing storm passed by the next morning we could actually see the foothills of the Alps in the distance through the freshly scrubbed air. Bill was abuzz with anticipation and began using the sight of his old friends as his compass. He chatted excitedly with the Dutch cyclotourists we spotted at an intersection a few hours later but was disappointed to learn that Splugen Pass wouldn’t be open for another week (they however seemed just as happy to have taken the train around it.) We won’t be traversing Splugen again but it is a potent symbol of the Alps for us and swapping stories about the route only heightened his anticipation. News of Splugen being closed added an edge of uncertainty and Bill wondered if the new pass he had selected was still closed too. Vague memories of Splugen being opened in part by the calendar and reports of a bad snow year from skiers we met in Rome helped counter our worries about pass closures. A spectacular thunderstorm that night would keep the air clear enough for us to ride the entire day with the foothills and a few snowy peaks as our beacon. And chatting with the 2 Americans from Spokane, WA who had been lightly snowed upon in the mountains the day before ratcheted up Bill’s nervous excitement even more. This was planned to be our earliest Alps crossing yet, but was it going to be too early? Would Map Man’s chosen pass be open? Were we likely to be delayed by more new snow? Would our clothes be warm enough? Would we be stuck at the base for days waiting for the roads to open? Uncertainty adds the zing to any adventure and the buzz on this one was getting even louder. Answers to our questions about fresh snow in the Dolomites and pass closures would have to wait—first we had some serious sightseeing to do at Valcamonica. Our visit to Valcamonica reinforced the evolving theme of this being ‘the year of obscure sites’. 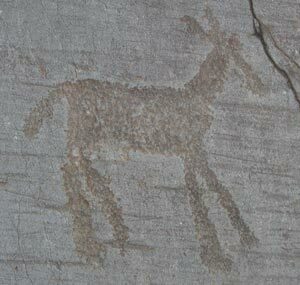 We read about Valcamonica and its ancient rock art cravings in a book we bought at New York City’s Natural History Museum this winter. But its far west location clashed with Ravenna’s eastern location, making Map Man’s head spin. He fretted about not being able to head due north from Ravenna to make our early June rendezvous in the Cortina region with friends from Portland. 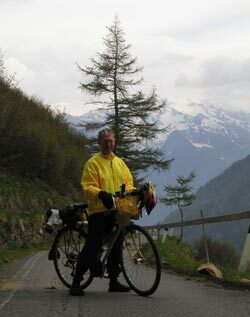 He had nudged us out of Greece a little early and we had pedaled hard to fit Valcamonica into the schedule. Valcamonica or Camonica Valley is in the Italian Lake District in the north. We had been frazzled by the heavy traffic around Lake Como in July 2001, so we were cautious about heading towards Lake Iseo at the south end of Valcamonica. Bill took comfort in Valcamonica being a dead-end valley with no ready outlets, assuming that would reduce the truck traffic in the area. A flint-tipped drill at the ArcheoPark. We also had our first of 2 “ArcheoPark” experiences in northern Italy at Valcamonica. ArcheoParks are small, educationally-oriented theme parks focusing on a historical period. 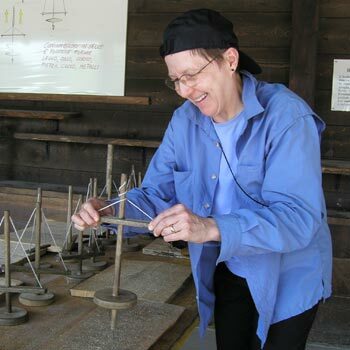 The one in Valcamonica covered a broad swathe of prehistoric time, emphasizing hands-on experiences with ancient tools. We got there too close to closing time to take it all in, but one guide walked us through each of the practice stations so we could try out a flint-tipped hand drill to make small holes in wood, a hollow reed used like a drill bit to drill large holes in stone, and a bow-like tool for starting fire (like Bill was doing on our website home page). They also had a number of huts set-up to demonstrate building styles and had them outfitted with the equipment and supplies for woodworking, ceramics, weaving, and metalworking of prehistoric times. It was a very well done combination of exhibits to look at and tools to use and the Park made the technology of prehistoric times come to life for us. Arriving in our alpine ski resort town of Ponte de Legno (‘Wooden Bridge’) was an unusually abrupt change in environs (especially after the prehistoric ArcheoPark). One of the pleasant aspects of bike travel is that the cultural and regional transitions come ever so slowly—the plodding pace of cycling means that we generally aren’t subjected to shocky changes unless we use motorized transportation like ferries and trains. We had moved slowly and diagonally through the flat agricultural plains of the Po valley into the Lake District at the foot of the Alps. The shift to hillier terrain was pleasant and we enjoyed the accompanying cooler weather and the interesting architectural changes. As we rode the length of Lake Iseo and along its source waters, the Olgio River in the Valcamonica, we were soon surrounded by 6000-8000’ high peaks. Though we were cocooned by steep mountains in this deep gorge we still were in the agricultural, valley culture for a couple of days. Leaving the valley was gradual on a well-graded 3700’ pull up into the taller and denser forest lands. We then turned off the main road and climbed a little more up another river valley to the village of Ponte de Legno it was like suddenly being in a different world. Ponte de Legno is all but asleep now, waiting for the snows to fall and the 30 some ski lifts in the surrounding area to being operating. The quaint little old town with cobblestone streets and 2-storied, slightly tilting stone buildings is enclosed by a small but spacious, modern resort town of wide streets, sidewalks, and curbs. Most of the 3-5 storey buildings are in the smart-looking, chalet-style with steep pitched roofs and generous amounts of exterior paneling and wooden balconies. The mountains seen from our hotel window were so close that we couldn’t look to the timberline—all we could see were lush green slopes, dense forest, ski lifts and a sprinkling of picturesque chalets. I felt like a time traveler: we went from spending 2 weeks in the hot, broad agricultural plains that were steeped in Roman history to being in cool, lush green of the mountains with the only distinctively Italian element being the difficult store hours. I looked out our window wondering “What happened, where am I?” as the contrast was so sudden and dramatic. There was that distinctive mountain chill in the air and we realized that suddenly we needed to worry about keeping warm enough instead of being cool enough. And Ponte de Legno was so much the classically cute and charming Alpine ski village that I kept expecting snow to start falling any minute. Our trek up to Gavia Pass got off to a rough start. First there were those signs that routed us the long way around town and thereby unnecessarily added what felt like hundreds of feet of gain to what was already going to be a full day. And then there was the “Road Closed” sign not long after that detour. Crest fallen, we stood in front of the sign doing our best to decipher the Italian. We decided to proceed anyway, as we have learned in Italy if they really mean the road is closed they build a temporary concrete block wall across it—this one just had a flimsy barricade across half the roadway. And indeed, by the end of the day we had counted 8 motorcycles, 4 other bikes, half dozen cars, a road crew, and a forest service vehicle on the closed road. Not too steep or narrow for Bill! This road turned out to be like no other we have ridden and we have been on some memorable roads. Half of the 12 mile (20 km) long road to the summit was a ‘one horse lane’—it was a little wider than our bicycles are long. And it was hard to imagine why this skinny little road existed and why it was still maintained as a seasonal, through-road. Perhaps its sole reason for being is to give access to the national park lands. Much of the road is too narrow for even 2 tiny European cars to pass by each other and in many places passing would require 1 vehicle backing up several hundred feet along this often cliff-hanger road, frequently without barricades. It was occasionally pushing my buttons, even though there really was plenty of room for us—something about steep grades and sheer drop-offs…. I did however have visions of having strangled Bill if he had brought me up here in a car. This amazing, windy little road had posted at 14% and 16% grades, of course on the narrowest of narrow stretches, and we also measured 20% in a few places. It was sometimes so steep and narrow that I was unable to restart when I pulled over to let the rare car go by or to rest, even with my bike only loaded for a long day ride. Several times I had to walk until I found a helpful 10’ length of lesser grade to get launched again. Bill is enough stronger and steadier that he can start up just about anywhere, even on this challenging road. Nerve-wracking as it was at times, it was a beautiful ride. We started from town at the 4,000’ level surrounded by lush forests, pastures, cute white and brown chalet buildings and the coolness of air swirling up from the rushing hillside streams. As we worked our way higher, we were quickly into more open, uninhabited grass lands. Occasionally the tortured little road skirted along the edge of a thin forest with its distinctive shadows and smells. The sun was warm and the sky clear enough for great panoramas and the broad hanging valleys of old glaciers across the gorge became more prominent as we climbed above them. We looked down the steep slopes at one point and couldn’t believe our eyes: there was same village in the valley directly below us. We had climbed up several thousand feet but hardly had made any forward progress at all because of the intense switchbacking--our effort was only taking us up. But despite the effort of the climbing, the constant roar of the nearly vertical rivers of water rushing almost a mile down the faces of the adjacent gorges was a welcome change from the more familiar traffic noise. And of course, one of the joys of the “closed” road was that there was essentially no traffic. We luxuriated in the peacefulness of the nearly deserted road by picking the outside bend of a hairpin turn with a terrific view for our picnic lunch with no fear of trucks barreling by us. As we munched and soaked up the grandeur of the mountains, we kept wondering just how far we would be able to go on this closed road and why was it closed. The closed quality of the road was punctuated by the few sightings of other life besides the ground covers. There were no grazing goats, sheep or cows looking back at us on these grassy slopes. There were no farmers rhythmically swinging their scythes. There were only a few tiny little flowers, a rare bird heard off in the distance and the only critter we saw all day was the disappearing rear-end of a presumed marmot. But seeing the names of Italian bike racers like “Pantani” (a peer of Lance Armstrong’s) painted on the road surface conjured images of rowdy, cheering crowds from a race season or 2 ago. It was hard to imagine those guys racing on this absurd little road that we just hoped to travel the length of and I couldn’t help but wonder if a few tipsy onlookers didn’t take the quick way down one of these amazingly steep slopes. Shaggy alpine grasses above timberline (and a little erosion). We climbed higher and the last trees finally disappeared and even the hold of the grasses on the soil became more tenuous. 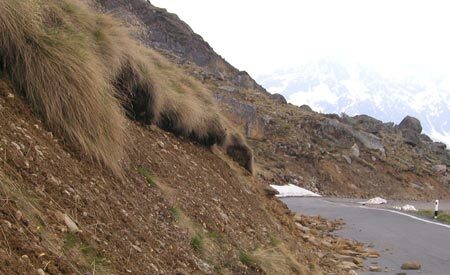 The pasture-lands gave way to the bunchy alpine grasses that uneasily rest on the rocky surface like a thick shaggy sheep’s skin. The sun slipped behind the heavy clouds that had been shrouding the mountain tops as we worked our way higher. The tundra-like alpine terrain took on a familiar eerie, surreal look. These relatively barren lands are so intriguing: beckoning and yet the harsh ruggedness of them sends a message to ‘beware.’ The combination of the cold, the grayness, and the steep areas stripped of their vegetation and topsoil from land or snow slides is like nowhere else. The lichens on the rocks become more prominent because they are no longer dwarfed by the surrounding vegetation like at lower elevations. Far below us was a small moraine lake with its characteristically milky jade green water. Its red tinged shore at one end was presumably from some specialized algae or some rare sediment. The silty appearing ‘beach’ around it seemed to lack any other vegetation, at least from our high vantage point. On this lake’s little plateau and a couple of others like it, there were jumbled piles of shattered rock that had fallen individually or were carried down the steep slopes by massive slides. The look across the gorge of hanging glacial valleys was so different than the look on our side yet we had to imagine the sides were really very similar. Snow appeared at about the 7,000’ level and it wasn’t long until there was occasionally snow on both sides of road. Over our last several hundred feet of elevation gain there were extensive patches of snow obscuring the pavement. We’d walk through the snow and slush then stop to dig the snow out of our shoes cleats before riding a short distance again until there was only snow ahead of us. Our day’s climb finally ended at just over the 8,600’ level with no trees and much of the sparse vegetation still wearing ‘winter white’. Snow at the very top was the reason the road was closed though a lone bulldozer was working to clear it. We had headed out not expecting to go far on this closed road so didn’t mind pushing our bikes through a little slush and snow to reach the summit. We made it to the peak of the pass but the official summit signs were 15’ out of reach because of the deep snow on the road. I couldn’t help but shudder at our turn-around point, as much from the foreboding bleakness as from the chill in the air. A sliver of pavement just below the summit. We paused to take in the peculiar stillness of this barren summit and the celebratory photos. When we had picked our way back down out of the deepest snow we stopped to bundle up in all the heavy gloves, hats, socks, shirts and jackets we had brought, knowing that it would be a chilly descent. The first part would be slow-going as we walked through the snow and narrow paths in the slush. Then we would cautiously ride where there were bits of bare pavement. Once out of the snow, we still would still be riding the brakes most of the way down because of the narrowness of the road and the tightness of the turns. We stopped countless times on the way down, resting our hands and arms and hoping to take the one photo that would capture drama of the day’s experience for us. As we worked our way down the mountain the trip up unfolded before us like a fast rewind: the snow disappeared, dry pavement reemerged, the gray skies gave way to the warmth of the sun, and the vegetation slowly became taller and lusher. At the half way point down the hill, the switchbacks became broader and the narrow ‘joker’ road widened suddenly to a normal looking road, again masking the secrets of the bizarre little alpine road above. And when we passed around the barricade partially blocking the road I was reminded that the snow was the least of the problems on that route. Passo Gavia is a very high, fairly obscure pass and the fact that it was just barely closed due to snow allayed our fears about our yet-to-come Alps-crossing pass being closed. Surely our lower, more heavily traveled pass would be open by now. After a stop-over in Bolzano to visit our favorite museum and the Iceman, the 5500 year old mummified mountain man, we headed off for more high riding. Though Bill keeps correcting me that this ride wasn’t really a pass, I maintain that a 5000’ (1500 m) climb should count as a pass for the ‘notches on my holster’ (we can’t figure out what would be safe to notch on a bike). These steep pitches did eventually calm down and we slowly made our way up the hill, though the steepness of the grades meant that we didn’t make our customary progress of 1000’ (300 m) climb an hour. Bill’s assessment is that on these extremely steep roads that we immediately exhaust our muscle’s glycogen supply, which means we quickly use up the ready fuel. With the high-octane fuel consumed in the first minutes of the climb, we had to go more slowly and rest more frequently for our bodies to mobilize more deeply buried energy reserves in the form of fat. And it certainly wasn’t a pretty sight when our already weary bodies encountered other very steep stretches latter in the climb. After all that work, we were horrified to discover only 1 of the several hotels that were supposed to be open in the village of Unser Frau was actually open, but at least we had a place to stay. It was early in the afternoon and Bill’s need to be in the mountains wasn’t met by being at 5000’ (1500 m). We dropped off our heavy panniers at THE hotel where we were the only guests, rinsed the brine off our faces from all the heavy sweating and rode another 1630’ (500 m) to the 6574’ (2000 m) level, bringing our ‘gain day’ to almost 5000’ (1500 m). This put us at the high end of the Schnalstal Valley and we were still dwarfed by mountain peaks. Fortunately the road ended or I am afraid mountain fever would have drawn Bill higher yet. But we could see the glacier on which the Iceman was found from this end of Schanlstal Valley, which added a nice piece to our Iceman experience. Today was one of those “gotcha” Italian holidays that caught us shorter of food than we like so we stopped in at the open café for 2 ice cream bars each. Even though we mostly coasted back down to the Unser Frau hotel, we were so hungry after the day’s 5000’ climb that we eagerly ate our usual pasta dinner. After showers, we then went downstairs for the full meal the hotel served of a fresh veggie salad, cream of asparagus soup, green beans, meat, and apple strudel for dessert and were just a little overly full. One of the pay-offs for going up this challenging road and the length of this dead-end valley (besides eating a lot) was to get a fuller sense of the life in these high alpine valleys: the ridiculously steep roads and the even steeper slopes that people live on. It is incomprehensible to look up at these seemingly almost vertical slopes and see a pasture that was cleared long ago of trees and a chalet-styled house and barn in the middle of it or on an edge of the green grassy area. They look like they are almost hanging in the sky as the mountains are so steep. And even more astounding is to see them operating a couple of the enormous arcing water sprinklers up that high. Their counterparts that we see at road level are highly engineered metal sprinklers look like personal-use missile launchers as they forcefully shoot the jet of water out a couple hundred feet. These houses are so high up that many of them have their own cable transport systems anchored just off the road. We assume that the farmers send milk down to the ‘low’ road to be picked up each day as we have seen a few hefty, 25-50 gleaming gallon-sized (100-200 L) stainless steel containers attached to some cable systems (or else they drink a lot of beer). I wonder if they haul other products up these cable systems too, especially during the heavy snows of winter. Many of these high mountain valleys have their own distinctive roofing traditions and so too did this valley. There was little metal, slate or tile used for roofing but very long, heavy wooden slats or shakes. The traditional way of securing the shakes was by running a 3” diameter tree trunk or timber across each row, with rocks placed along timbers to anchor it all down. So traditional are these horizontal timbers that we noticed some new roofs using them not as structural elements but merely as regionally-correct decoration, though the photo to the left is of a particularly rustic building. The real reason for going up the Schnalstal Valley to Unser Frau village was to see the ArcheoPark capitalizing on the nearby find of the Iceman, the 5500-5300 year old mummified man found on the nearby glacier in the early 1990’s. We have visited Otzi, as he is locally known, several times in Bolzano but thought it would be fun to learn more about his era which was the theme of this small museum and outdoor display. And visiting odd little museums is one of our delights as there is always a chance that the answer to one of our old questions will be found in them. At this north Italian ArcheoPark I finally got the answer to my question of why fertility icons were so important in prehistoric times. We first encountered Paleolithic “Venus’s”, as the fertility icons are known, in Austria 2 years ago. There on a small little road outside Willendorf we happened across the rustic, bedroom-sized museum celebrating the site of the discovery of the ceramic “Venus of Willendorf.” She is only about 2” high and is quite the naked, Rubenesque woman with massive thighs and pendulant breasts. Sadly, she also has a very small head. This Venus is dated to about 25,000 bce and such figures have been found throughout the west and near east. The similarity of these icons has been a bit of an archeologist’s puzzle as communication over that broad area was limited at the time. Having grown-up with ‘zero pollution growth’ as the global goal and around Catholic families with a half dozen or more children, I had wondered why there was a need for a fertility cult—it seemed like too many children, not too few was the challenge. But at the Unser Frau ArcheoPark I finally understood the role of the Venus’s, as they were sculpted at a time that was probably close to zero population growth, and not by choice. It turns out that the Paleolithic woman wasn’t overly fertile. She had fewer reproductive years than today’s industrial society women, being fertile from about age 18 until about 40. Three to four years of breastfeeding per child, chronically poor nutrition, and strenuous daily work limited her fertility rate to about 4 to 5 pregnancies in her lifetime. Her reduced fertility combined with a high infant mortality rate probably meant that she raised 2 to 3 children, at most. No wonder at a time of scrawny, depleted women that plump, voluptuous and more likely fertile women were literally idolized. Not too surprisingly, when the Neolithic period began emerging around 7000 bce with its non-nomadic lifestyle of farming and stock breeding, the fertility rate and population size shot up. The availability of cereal gruels is presumed to have shortened the breastfeeding years and that combined with the improved nutrition allowed a population explosion. It was somewhat tempered by the shorter life span due to the faster spread of infectious diseases in urban life and particularly the shorter life expectancy of women due to the increased mortality that comes with more pregnancies. And fertility icons changed with the changing times: the 3000 bce Cycladic (a chain of Greek islands) marble idols are of women with more usual amounts of body fat and the Minoan’s (about 1500 bce) fertility goddess couldn’t be more different than the Paleolithic Venus’s with her normal sized head; long dress with exposed breasts; and Barbie-doll-like proportions, especially her exaggeratedly small diameter waist. Clearly the nutritional problems leading to decreased fertility were a thing of the past. We enjoyed our side trip to see current life in the Schnalstal Valley and the ArcheoPark depicting the world at the time of the Iceman. But the real gem of understanding came from the single, small panel about prehistoric fertility rates and therefore the significance of the Venus figures—it is the unexpected bit of understanding that will ripple most broadly from the outing. 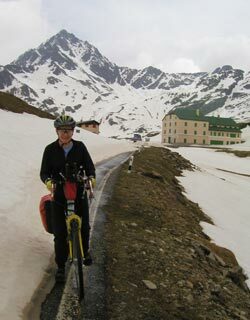 We headed into Austria to buy new waterproof panniers at the first opportunity and then we planned to take public transportation back to Cortina to pick-up our big box of camping gear. But it didn’t take long to be discouraged about how far we would travel to buy Ortlieb or Vaude panniers as we seemed to be in the land of high-priced but light-duty bags. Plus, the train-bus connections between Italy and Austria were less convenient that we expected. After only a couple of days in Austria we decided to cut our losses and give up on camping this year. We spent a day going back to Cortina on the bus and train to pick-up our box and mailed it back to Portland from Lienz, Austria. We may still have to deal with the box of panniers if it ever arrives in Cortina but hopefully it is for some mysterious reason on its way back to Portland by now. I was pooped from all the mountain riding we did in the Dolomites so Bill quickly routed us onto Drau River in southern Austria for what should be a week or 2 of easy riding. We’ll dip into Slovenia for a couple of days then head for Graz, Austria. We are heading east to Budapest, one of our highlight-destinations for the year and will check-off a few more sights on our “Next time we’re in ___ list”. But Bill has just commented that this year’s journey is lacking pizzazz, so there may be some route-reworking in the works. It was planned as a ‘fill-in some missing pieces year’ but that may not be good enough—we’ll keep you posted. The box of panniers finally arrived in Cortina—the day after we mailed the other gear back. Bill spent a day going back to Cortina and picked up the box to send back home. It’s a shame to have missed it by a day, but we had already waited 2-3 weeks past its delivery window. It looks like when the box arrived in Italy that a routing label was placed over the postage so when the box finally showed up it had a hefty “postage due” on it—one of those “tourist taxes” we end up paying ‘cause we don’t have quite enough information or a good enough command of the language.